Who are those two boys on bikes, riding away from that burning building? 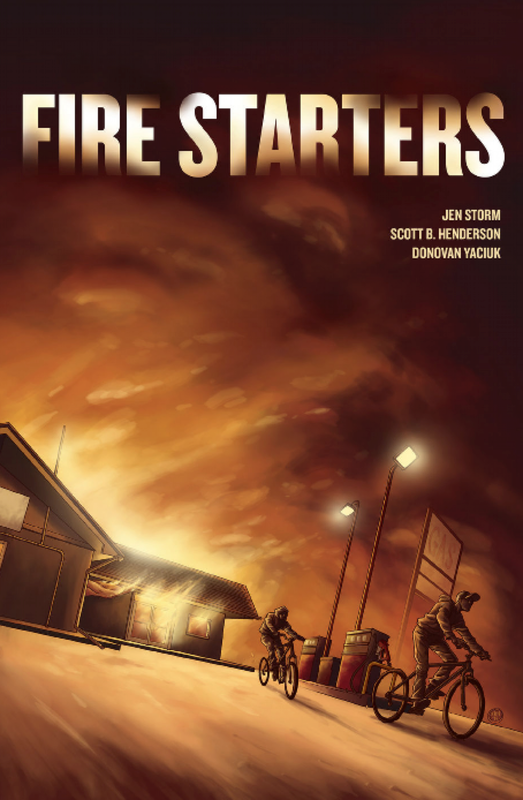 Are they the fire starters who set that building ablaze? ..."explore how all the people in a town — the bully, the bystander, the underdog, law enforcement — would react and what their role can be in reconciliation because I think a lot of people hear that word and think really big grand picture and don't see how they can fit into it." Storm is Ojibway from the Couchiching First Nation in Northwestern Ontario. With her story, she moves reconciliation from a concept to an on-the-ground example of what reconciliation could mean, in action, in a small community that is predominantly White. Within a few pages, we know that the building is owned by a Native man. We also know that Ron and Ben, the Native teens, did not set that building on fire. We know that it was done by Michael, the sheriff's son, and we know why he did it. Ron and Ben are being held at the jail. People think they're the ones responsible for the fire. When they're let go, they are taunted on the school bus and at school, they're surrounded by kids who call them fire starters. A fight breaks out. There's more of this kind of thing later, at a hockey game. Finally, the sheriff figures out that it is his son, Michael, who set the fire. After that, the story shifts to a circle justice gathering. It is a Native system of justice. In the next scenes, we see Michael helping to clean up the inside of the burned building. Storm's story is a very thoughtful look at the two systems of justice. The Native boys are in the White system, being interrogated and intimidated. It is a stark contrast to what the White boy experiences in the Native system of justice. It points to the path Storm is looking for: how a community can heal, rather than how it could punish and inflict more harm on people. There are two especially poignant aspects to the story. First is the poster on the wall of the building that was set on fire. It is of a Native woman. She's missing, and the poster is asking for help, to find her. For information about Missing and Murdered Indigenous Women, I suggest you read the news stories archived at Aboriginal Peoples Television Network (APTN). The second is Michael's friend. His name is Jason. Though he keeps it quiet, he is Native, too. He's torn between his friendship with Michael and his own strong sense of doing what is right, especially because he--like the Native boys being mistreated by the justice system and the townspeople--is Native. I recommend Jen Storm's Fire Starter. There's a lot to study, think about, and of course, talk about. I'll likely catch heck from people who think it is unfair to criticize a book for what it leaves out. In some instances, I'd agree. Sometimes, it isn't fair. Sometimes, though, it is. If you're an American, you think of the Grand Canyon as a spectacular place. It is that, for sure, but if you're a Native person, particularly one from the tribal nations for whom the canyon is significant as a site of origin or of spiritual importance, you may think of it as a spectacular place, but you are also likely to think of it in other ways that you may or may not feel ok to talk about. The point of view in Jason Chin's Grand Canyon is not a Native one. Kirkus describes the little girl as Asian American. Other than her and her dad, there aren't any people in the book. They're on a solitary journey into the Grand Canyon. I think it helps readers focus on the land and animals of the present, but of the past, too. There are pages where the little girl is transported to the past. All in all, the book is packed with good information. Science teachers will like it, a lot. It has gotten starred reviews from most of the major children's literature review journals. It may likely be considered for awards this year! 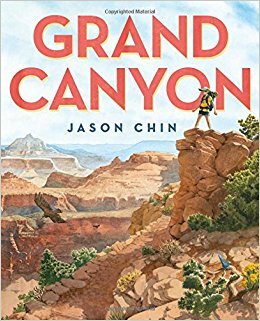 The Grand Canyon is published in 2017 by Roaring Book Press (part of Macmillan). I'd like to offer some thoughts on how Chin can "kick it up a notch" (remember the Food Network chef who used that phrase?!). Later, several different cultures settled in and around the canyon, including the Ancestral Puebloans, farmers and skilled potters who lived in multi-room buildings called pueblos. Today's Hopi and Zuni peoples trace their heritage to the Ancestral Puebloans. It wasn't until Hopi guides led Spanish explorers to the South Rim in 1540 that the first Europeans saw Grand Canyon. The park covers more than one million acres of land and most of the canyon lies inside the park boundary, while parts of it are within the borders of the Hualapai, Havasupai, and Navajo Indian reservations. The canyon remains a place of cultural and spiritual importance for many Native American tribes, including the Hopi, Navajo, Zuni, Paiute, Apache, Hualapai, and Havasupai. If a second printing is ahead of Chin, I suggest he replace "tribes" with "tribal nations." And, it'd be great for kids to see a map of the reservations Chin references in that paragraph. Google includes some on their maps. 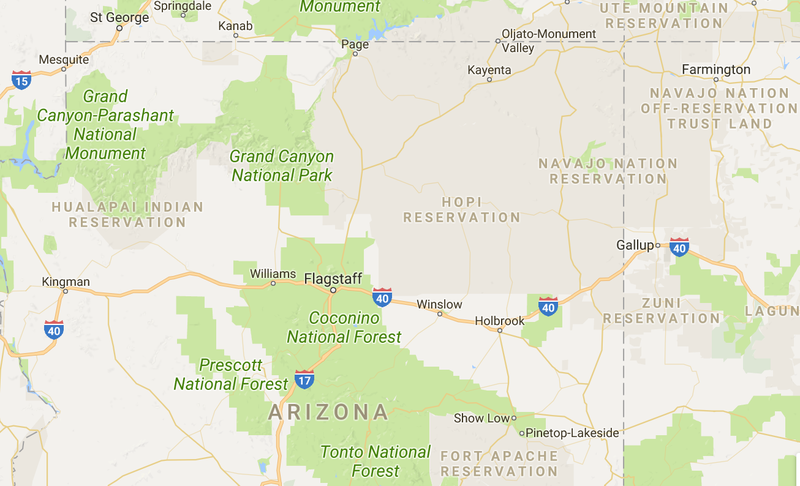 Here's one of that area that shows Grand Canyon National Park. 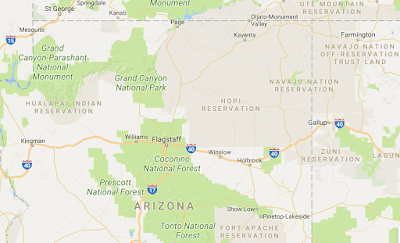 To the left is the Hualapai Indian Reservation; to the right are the Hopi Reservation, the Navajo Nation Reservation, the Zuni Reservation, and at the bottom, the Fort Apache Reservation. Another suggestion is to bring Native languages into the book. On that first page, where we see the mountain lion descending into the canyon, Chin could use the borders in the same way he did elsewhere in the book. On this first page, they're blank. He could get in touch with the tribal offices for each of the reservations and ask them what--in their language--they call the Grand Canyon. He could do a small sketch of a Hopi child saying "At Hopi, we call it ___" and so on. And on that page about the Kaibab Formation, Chin could add a note about the word, "kaibab" and what it means. Another addition could be a paragraph about President Wilson's actions to designate it a national park. How did tribal leaders feel about that, then? How do they feel about it, now? Wouldn't all that additional information be cool? Do you have additional suggestions?